Camping is a fantastic way to explore the great outdoors, get some fresh air and spend quality time with friends and family. 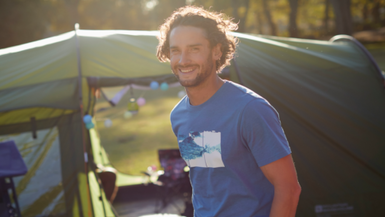 Camping for beginners and the inexperienced can be tricky, so here are our top tips to make your first time camping enjoyable and stress-free. There will be a large variety of campsites available to you for your first time camping. Things to look out for include whether they are considered ‘child friendly’, if dogs are allowed and the facilities such as toilets and showers that are available. As a beginner camper, it’s a good idea to book a campsite with high quality facilities and a town nearby so there are plenty of places to eat and buy supplies if you forget something. Tents come in all shapes and sizes and it’s important to choose one that’s right for you. When picking a tent, it’s a good idea to choose one that’s a size or two bigger than the number of people using it. This will allow enough room to store your gear in the tent and have comfortable space to sleep. If you’re unsure which tent is right for you, take a look at our tent guide. Whatever time of year you choose to camp it’s a good idea to bring a sleeping bag as temperatures can drop at night. When choosing a sleeping bag, pay attention to the season and temperature rating to ensure it will keep you at the optimum temperature for the time of year you choose to camp. Our sleeping bag guide gives an outline of all the important considerations when choosing a sleeping bag. One of the most important tips for your first time camping is to have a practice pitch of the tent at home. This will ensure you know how to put up and take down the tent and any problems can be solved while you’re at home, not at the campsite! Once you’ve had your practice pitch of the tent why not have a practice camp? Camping can be daunting for beginners but spending a night in the backgarden will help you judge the amount of layers you’ll need to wear and if your equipment is adequate. When setting up your tent, try to pitch it in an area where the ground is level and clear of any debris which could cause damage to your tent. Always put the back of the tent to the wind to give it more stability and put your pegs into the ground at a 45 degree angle. Camping for beginners can be a challenge, particularly when you’re not sure of the type of equipment you need. For help, check out our camping equipment guide and make your own checklist to ensure nothing is left behind. Planning what you’re going to eat and how you’re going to cook it can save a beginner camper a lot of time and hassle. Check campsite rules to see if you’re allowed campfires and research the local area for any pubs or restaurants where you can eat if things don’t go to plan! Camping for beginners can be exciting and memorable if you get it right. Follow these 8 tips and your first camping trip is sure to be a success! 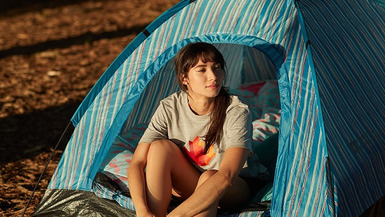 Now you’re ready for your first camping trip, it’s time to get the right equipment! Check out our range of camping chairs, tents, sleeping bags or our full camping range.